Yep, a doggie diaper is exactly what it sounds like. Just like a baby’s diaper, the doggie diaper covers the dog’s hindquarters, so he or she can relieve themselves if they need to. Two styles are available. Diapers for male dogs have belly bands which fit around the midsection. Diapers for female dogs are more of a full coverage situation. Whether for a male or female, both styles are available in disposables or in cloth diapers. Although disposable dog diapers are more convenient, they tend to cost more, and the environmental implications are greater. On the other hand, cloth diapers cost more initially, and may be messier to deal with, since they need to be washed. 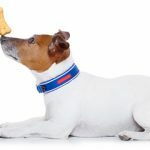 There are several reasons where dog diapers may be particularly helpful. 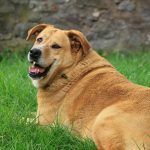 Caused by a variety of health issues, urinary incontinence can also become a problem as dogs become older, and lose control of their muscles. This condition should not be confused with illnesses such as diabetes or a urinary tract infection. In fact, if your dog is having a lot of accidents, he should be checked for health problems. However, a dog diaper can protect your carpeting and furniture, while you work on getting your dog checked out by a veterinarian. While recovering from an illness or injury, some dogs are unable to go outdoors, or stand to relieve themselves. Having a diaper on your dog can help to make your dog’s healing time more comfortable for everyone involved. As some dogs grow older, they lose the ability to control when they have relieve themselves. 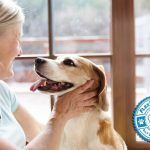 Other dogs that are elderly have a hard time standing or going outdoors due to joint pain and arthritis. A dog diaper is helpful in preventing accidents in situations like these. Dog diapers can be particularly helpful when you are potty training a puppy. They will help to save your carpet and furniture. 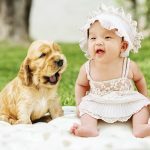 Should you decide to use a diaper when housetraining your puppy, be sure to immediately take him or her outdoors when you see that they are relieving themselves in the diaper. Simply remove the diaper and show the puppy where to go. 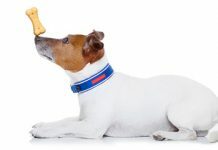 Use praise and treats for reinforcement, when the dog goes where he is supposed to. 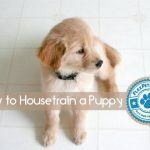 It can be a very long and frustrating experience to potty train a puppy. While some puppies learn quickly, others can take months before they understand what to do and what not to do. It is best to mentally prepare yourself for the possibility that it could take weeks or months to train your puppy. 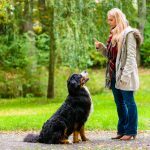 Here are some guidelines that make wearing a diaper as effective and comfortable as possible for your dog. 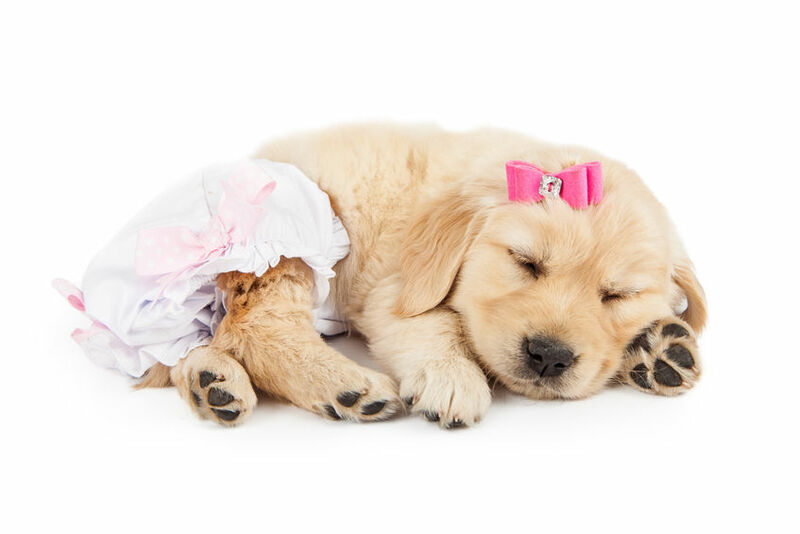 Begin by researching the best type of diaper for your dog’s specific needs. 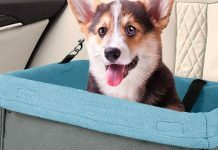 Factors to consider include your budget and lifestyle, the type of coverage that your dog needs, and how absorbency your dog’s diapers require. Now that you have selected a diaper, follow the package directions that will help you to measure your dog to find the right size and fit. 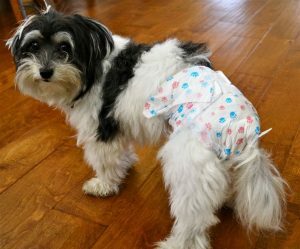 Be sure to check your dog’s diaper often, and change it whenever you see that your dog has used it. Having a soiled or wet diaper on your canine for too long of a time will cause him or her to be uncomfortable, and can also cause a bacterial infection or a rash. Wearing gloves when changing your dog will prevent you from touching his waste. Clean your dog with disposable baby wipes. Washing your hands with soap and water when you are finished is a given. Pay attention to any signs of a rash or inflammation. Any itching, scratching or biting the affected area is also an indication of a problem. If this happens, follow your veterinarian’s advice. 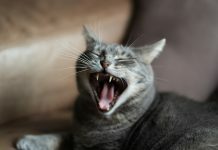 Previous articleHow Do Cats Communicate?